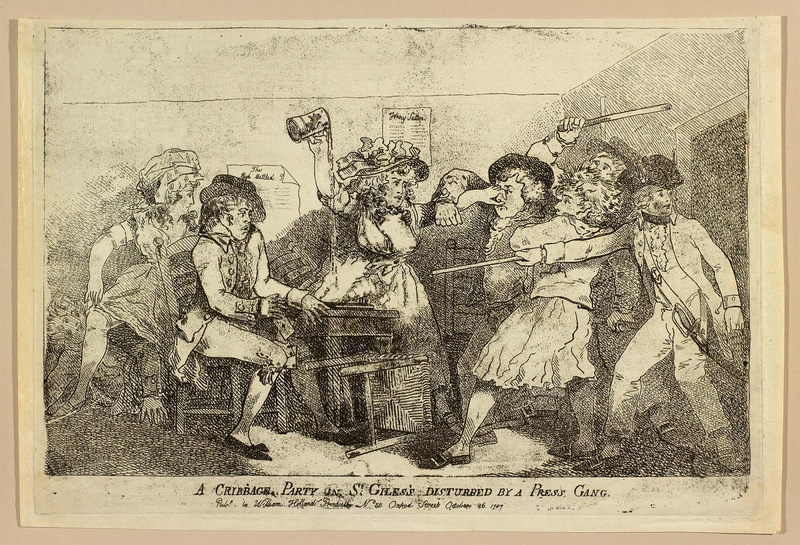 A Cribbage Party in St. Giles's Disturbed by a Press Gang, Thomas Rowlandson, 1787, Royal Collection Trust. Lest you think that the last Rowlandson image (that of a sailor cradling his infant and embracing his wife) typifies the work of the artist, here's a more rowdy scene! Illustrating the popular subject of a press gang, and the work of women in resisting, an officer leads a gang of tars into a party to kidnap a few unlucky sods. On the far left, a woman throws her petticoats over a cowering man, while another chap sits dumbfounded at the table. 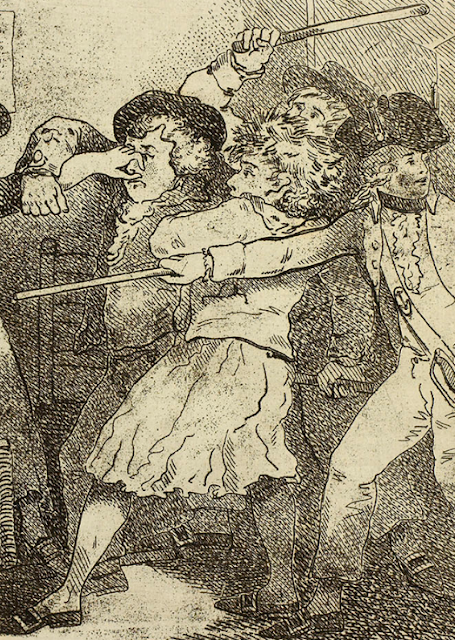 In the center of the images, a woman stands tall and spills ale with the one hand, while fighting off three terrified sailors with the other. Even the officer looks like he regrets the decision to tangle with her, gesturing forward while glancing back as if hoping for reinforcements. In the grip of the powerful woman, a sailor in a round hat tries to break her grip. His jacket has a slash cuff with cloth covered buttons. Beside him is a tar in slops and a jacket with no vents and a slash pocket at the waist. This sailor's hat has been lost, giving us a good view of his horrified expression. In his right hand he holds a cudgel or rattan, and on his feet are pointed toe shoes with rectangular buckles. Behind the both of them is a sailor in a round hat wearing trousers and the same fashion of shoes as his mate.